A random break in the heat is always welcome in my book. I didn't necessarily need a jacket today, but if I could wear one I was going to take advantage. Does anyone else get ready for work, change their mind 5 minutes before they leave and then change completely? Just me? K. That's why I'm late almost every day. Anyway, I wasn't going to get to wear this cute top sans jacket for work, so yay for cooler temps! After work, this transitioned flawlessly to dinner without looking stuffy. 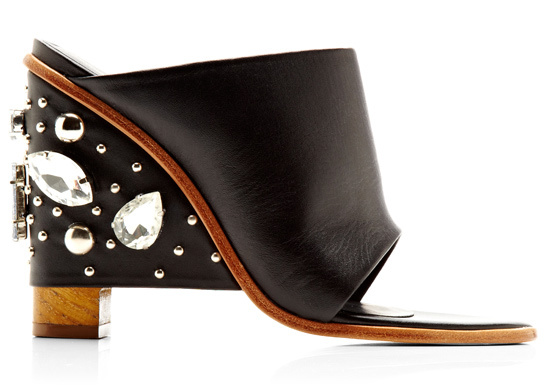 Let's take a moment to talk about the Mule, shall we? They're SO ridiculously 90's but the second I saw these Tibi wedges I was on board. You know my rule though, never spend too much on trends, so I found a pair I liked for about 1/10th of the price and decided that would be a nice way to dip my toes in. How are we feeling about these shoes the second time around? Jacket, Gap (similar from Gap). Jeans, JustFab (similar from Macy's). Mules, Jessica Simpson c/o Belk (exact). Linking up with Walking in Memphis in High Heels today!